Are you bold enough to wear your blankie in public? At what age do you give up being attached to your blanket? Is your idea of total bliss wearing a colorful Snuggie? 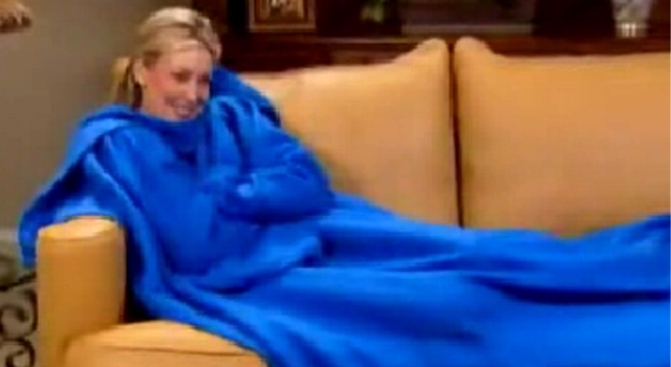 The Snuggie is that latest pop phenonomenon for grown-ups who love wearing fleece blankets with oversized sleeves. Well, Snuggie enthusiasts, your day has come. Soon it will be time for New York's first Snuggie Pub Crawl, on April 18, from noon to 8 p.m. The cozy event takes place simultaneously in two major cities -- New York and Chicago. The Snuggie Pub Crawl started out as a silly idea amongst friends, according to SnuggiePubCrawl.com co-founder Dan Kuthy. They launched the www.SnuggiePubCrawl.com Web site in February and soon received more than 225,000 hits with folks from around the country eager to get warm and comfy in public. PubCrawls.com is co-producing the first-ever New York event. You might recall that group recently helped drink their way into the Guinness Book of World Records with the largest pub crawl ever. More than 3,100 pub crawlers participated on St. Patrick's Day. Some bars on the Snuggie Pub Crawl list include Village Pourhouse, SideBAR and Van Diemens in Manhattan. The Snuggie Pub Crawl is also for a good cause, organizers said. Donations will go to help children at the AC-Orphanage in Arusha, Tanzania, to provide clean water and shelter. Being attached to your blankie never felt so good.